It is indeed the most wonderful time of the year! As your Christmas party creeps closer, so does the time-old tradition of pulling your cracker! 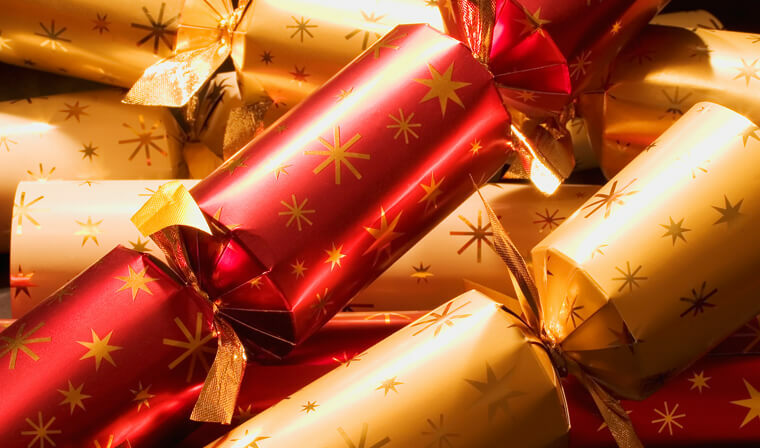 The origin of the Christmas cracker dates back to 19th century London, where a sweet shop owner tried to cash-in on the French bon-bon craze. Needless to say, it didn’t exactly go down a treat! Therefore, to spice it up, he added the famous bang – the rest is history! If you’re wanting to stuff the breasts of your colleagues, friends and family with laughter (or, snuff the Christmas party mood quicker than a mulled wine scented candle) peruse our top picks for Christmas cracker Jokes. Here’s hoping no one roasts your chestnuts over an open fire at this years’ Christmas shindig! 11. What happened to the man who stole an Advent Calendar? He got 25 days! 12. Why does Santa have three gardens? So he can ‘ho ho ho’! 14. Who is Santa’s favorite singer? Elf-is Presley! 15. What did Santa say to the smoker? Please don’t smoke, it’s bad for my elf! 16. What did Adam say to his wife on the day before Christmas? It’s Christmas, Eve! 32. What’s the difference between Ryanair and Santa? Santa flies at least once a year! 33. What did Mrs. Claus say to Santa Claus when she looked up in the sky? Looks like rain, dear! 34. Why does Santa go down the chimney? Because it soots him! 40. What do you call a bankrupt Santa? Saint Nickel-less! 41. What do you get if Santa goes down the chimney when a fire is lit? Krisp Kringle! 42. Why are Christmas trees so bad at sewing? They always drop their needles! 43. Why did the turkey cross the road? Because he wasn’t chicken! 46. Why is everyone so thirsty at the north pole? No well, no well! 50. Why is it so difficult to train dogs to dance? They have two left feet! 1. Did you know that Santa’s not allowed to go down chimneys this year? It was declared unsafe by the Elf and Safety Commission. 2. Knock Knock – Who’s there? 3. Waiter! This coffee tastes like mud – Yes, it’s fresh ground! 4. Got a Christmas card full of rice today, I think it was from my Uncle Ben. 7. If money doesn’t grow on trees, how come banks have so many branches? Looking for a fun and inexpensive way to entertain colleagues and clients this Christmas? Make your Christmas party a Quiz-mas party and book with Quiz Coconut this year! Trivia nights are the perfect festive trivia solution. For instance, they’re fun, cost-effective and hassle-free! At a typical Quiz Coconut event, we serve up all the trimmings! we have pictures, a music round, interactive and creative challenges so that everyone feels they can contribute!